Inside the Duke of Benedict pub, a local tramp called Kermit (Jack Woolgar) has a last pint then staggers drunkenly out into the churchyard, watched by the publican, Hooper (Jack Watson), and Olliphant (John Cater). 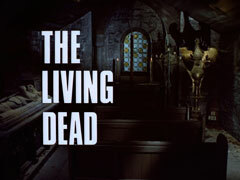 Giggling foolishly, Kermit is stunned to see a white figure rise from a tomb and enter the chapel. Olliphant and Hooper hear the chapel bell toll and rush out to find a gibbering Kermit say he saw the dead duke's ghost, but the chapel is now empty. Mrs Peel stops at the lights, only to find amber reads "MRS. PEEL" and green "WE'RE NEEDED" - Steed is behind her, and they drive to the churchyard. He says the ghost was said to be Montague Staplow, 6th Duke of Benedict who died in 1698, and after whom the pub was named. All the Staplows are buried in the graveyard bar Rupert, the 15th Duke, who died five years beforehand in a local mine disaster. 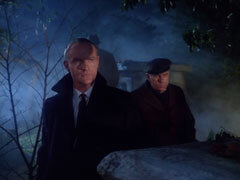 They discuss ghosts and likely suspects for a hoax, watched by a sombre man lurking behind a tomb. Steed visits Kermit, who now claims he was drunk and hallucinating, and 'never hears anything either'. 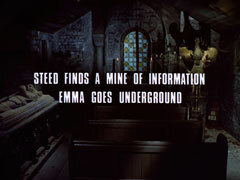 In the chapel, Emma finds Mandy Mackay (Pamela Ann Davy) lying on the ground. She's a ghost enthusiast from FOG (Friends of Ghosts) and claims to sense ghosts all around. 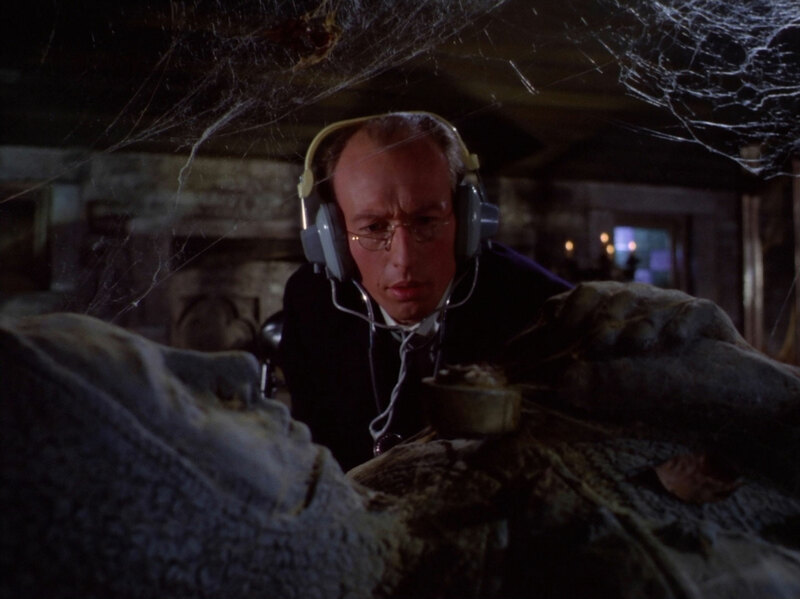 The watcher from the tomb enters, dismissing her clains as cant and mumbo jumbo - he's George Spencer (Vernon Dobtcheff) of SMOG (Scientific Measurement of Ghosts) and a skeptic who hopes to prove the sighting a hoax. Steed enters the Benedict Estate, happily ignoring a large "Keep Out" sign - and is immediately shot at by a gamekeeper called Tom (Alister Williamson). The estate manager Masgard (Julian Glover) asks Steed whether he saw the sign; Steed mischieviously says he "would have preferred a 4 point Doric" (i.e. minute text) and Masgard grabs him by the lapels angrily. The current Duke, Geoffrey (Howard Marion Crawford), drives up and Steed takes the to opportunity to escape Masgard and button-hole the Duke, who apologises for Masgard's roughness, saying the high level of poaching makes him too serious. They share a claret and Steed asks for permission to shoot game on the estate. Masgard enters and says that's impossible because of the poaching and Steed says the visit wasn't wasted as he at least accessed the Duke's cellar. Masgard is livid, asking the Duke why he let him go down to the cellar and is told it's an old English custom to refer to wine stock as one's cellar. "Maybe he's not familiar with old English customs", muses Steed who leaves, passing Tom carrying a huge box of sun tan lotion. At the pub, Steed and Emma compare notes, moving away from an eavesdropping Olliphant, meanwhile Spencer hears a strange noise in the chapel... The bell tolls and everyone rushes across from the pub, only to find Spencer hanging onto the rope, run through with the sword from the 6th Duke's tomb. Back at the pub, Kermit turns up and orders two bottles of his usual - he reconsiders and draws a wad of cash from his pocket and orders two good bottles instead. Steed follows him out and learns he's been paid by Masgard to shut up about the ghost. 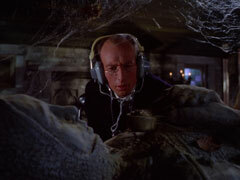 Next day, Masgard admits he did, to prevent ghost-seeking tourists from destroying the estate. Steed leaves the estate but sees Tom in the grounds, applying foundation after rubbing his face! Emma meanwhile joins Mandy in a vigil at the chapel. Steed returns to the pub and asks Hooper about the duke - the current one has no backbone, but the previous duke was a champion of the local people and a good miner - he was lost in a pitfall, along with 30 visiting miniing experts, and the bodies were never found; furthermore, Masgard has only been in the village a month despite his familiarity with the duke. 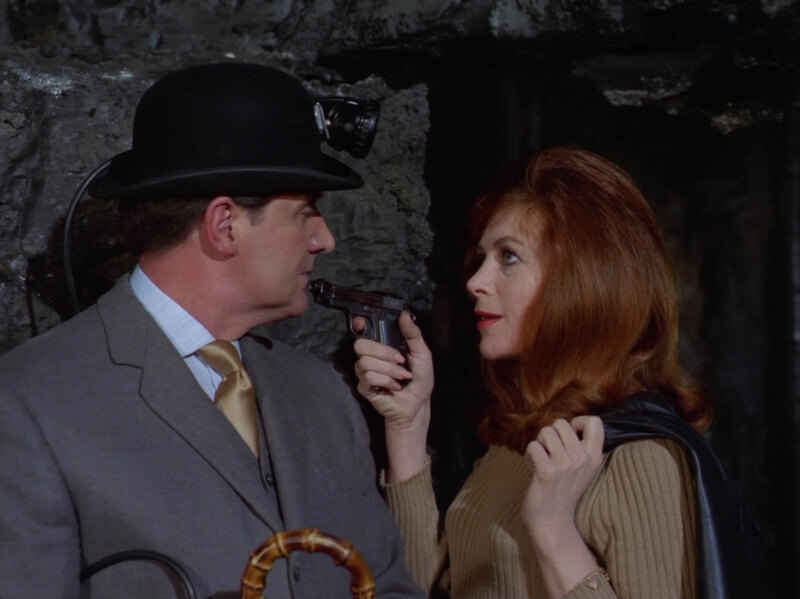 The bell suddnely tolls again and Mandy runs screaming across the churchyard, claiming the ghost took Mrs Peel. The duke arrives, offering overly familiar condolences and the assistance of his men in searching for her. Kermit tells Steed they're looking in the wrong place, "they should try the mine, that's where the others are". Masgard appears and he runs away. Steed catches up to him at the mine and Kermit says the Duke and his colleagues didn't die, they're still working in the mine - he hears them. 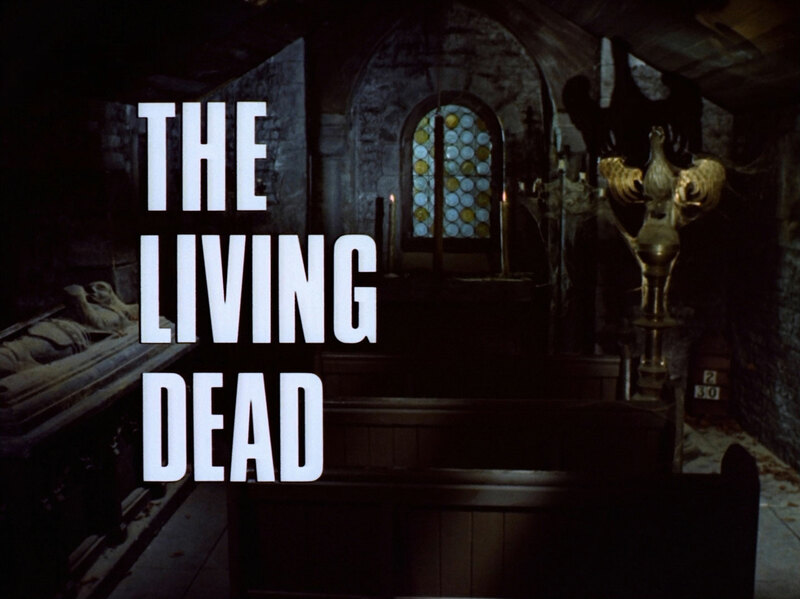 A shot rings out and Kermit falls dead, and Steed hears the clink of hammers in the silence. 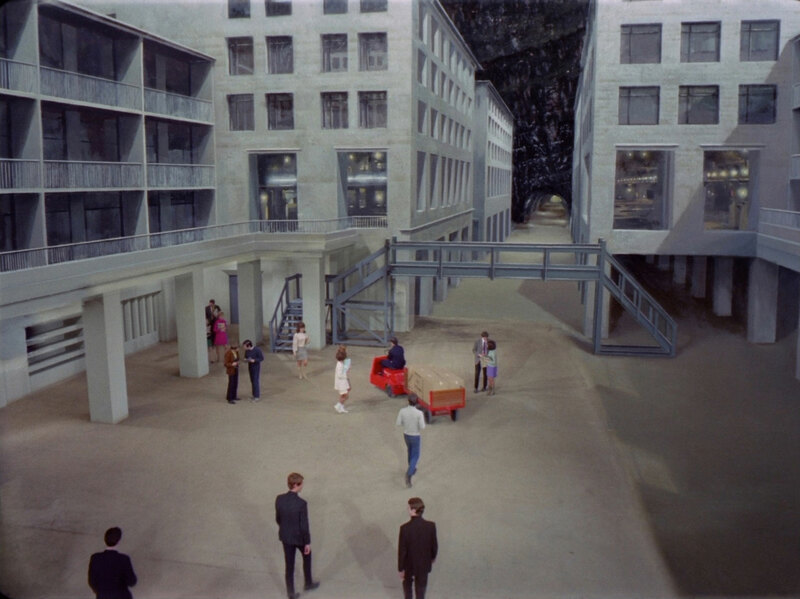 Mrs Peel comes to in a whitewashed cell, and is astonished to see the modern concrete town outside in full sun. 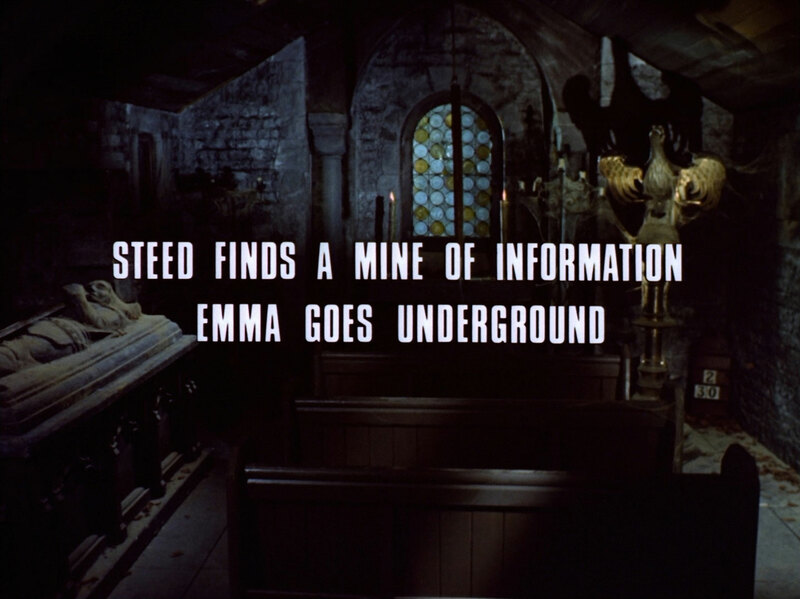 Steed meanwhile breaks into the estate - it's midnight - and makes his way to the cellar: sun tan lotion, canary in a cage, a man in a gas mask emerges from a hidden door and Steed clobbers him. Before he can search further, Masgard and the Duke enter and he takes the worker's coat and mask, passing by them carrying a box but after he leaves the Duke panics when he finds the unconscious worker. Steed rushes to the pub. looking for someone who can take him down the mine. Hooper is an old miner - he refuses to enter the mine, but he'll send Steed down in the cage. Mandy overhears and insists on coming with them, batting her eyelids to weaken Steed's resolve. 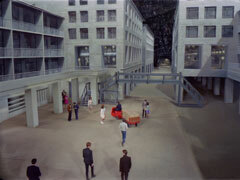 Emma sees a firing squad led by Olliphant execute a miner while Steed and Mandy poke about the mine. 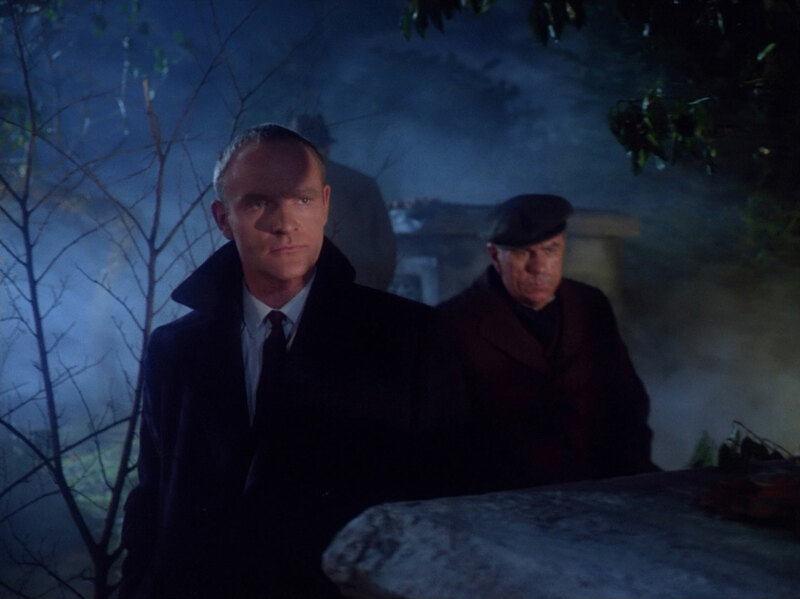 They turn to go, unaware that Masgard and Tom have knocked out Hooper and cut the lift cables, when Steed's umbrella goes straight through a supposedly solid rock fall. He opens a door into the subterranean city, seeing Rupert, the 15th Duke (Edward Underdown), and Mandy pulls a gun on him. Rupert delivers Emma's breakfast, telling her only 5 of his companions still live and they'd been held down there to build the town. Masgard enters and reveals his country's plan to house an army of 20,000 men - not yet arrived - in the town while Britain is laid waste with nuclear weapons; they'll leave the mine when the decontamination reaches a safe level. Outside, they see Steed being led to execution by a nervous Olliphant; Emma overpowers Masgard and Tom and rushes off to save him, battling Mandy on the way. She kills Olliphant and the firing squad with Mandy's submachine gun, earning a couple of kisses and a mention in Steed's will. rupert and his colleague appear, bearing Steed's coffin, and lead them to the only remaining operational exit from the mine, which they sabotage once back on top. Mandy and Masgard call out the guard after finding the dead squad, but they're too late to prevent our heroes escaping and Masgard realises he's trapped them all in the mine by cutting the cables. 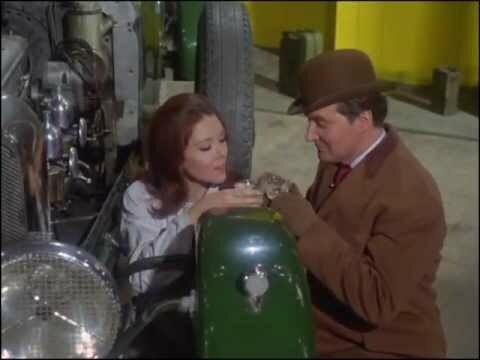 In Steed's garage, a cockney mechanic is trying to fix "ghosts in the engine" of Steed's Bentley - it's Emma in a scene from a Modern Pygmalion; they swear pax and sip some champagne.